Bitcoin adopts public key cryptography for bitcoin exchange. easy to get understanding about private key and public key. Now I'd like to talk about cryptography used some public key cryptography. Public key cryptography is encryption method that encrypts and decrypts data using two keys paired. It is a cryptography to implement Diffie-Hellman Key exchange concept. Use public key to cryption or private key to decryption. Easy to adminstration of keys and interoperable excellent system. ①Alice prepare key pair（Alice's private key, Alice's public key）,publishing public key(Alice's public key) to Bob. ②Alice have Bob encrypt sentence(Hello Alice!) with public key. 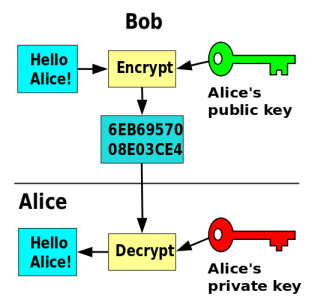 ③Bob sends encrypted data(6EB6957008E03CE4) ,Alice decrypt the data with private key. RSA cipher use to encrypt modular operation and nature of prime numbers. Now,Let's see how to calculate by RSA, while looking at the code. Using Greatest common divisor to derive the public key e.
Repeat assigning the value of "b" to "a" and the value of "a% b" to "b". The value of "a" when "b = 0" is the greatest common divisor. Use lcm and gcd to derive the "l". Euclidean algorithm calculate greatest common divisor of "a" and "b". Furthermore expand to euclidean algorithm can find (x, y) that satisfies 「ax + by = gcd(a, b)」. Public key"e" is smaller than "l" and greatest common divisor of e and l is '1'. Private key "d" finds from 「ed = 1(mod l) d」. Above formula converte to「ex + ly = 1」. Now,use the Extended Euclidean Algorithm to find x and find the private key d.
Since gcd 2 may take a negative value,so "a% l" calculate to take a positive number. 「a% l 」return "a" when "a" is positive,Add "l" when negative. In the case ,subtract e from b, "ex + ly = 1" holds. →Pow(built-in function) can describe 「c = m^e mod n」. →Pow(m, e, n) means that describe「m = c^d mod n」too. →Return True when decryption data equal message"m". That means decryption success. Bitcoin don’t use RSA , but Iｔ think that knowing the public key cryptography makes it easier to understand the concept of private key and public key.